The Valley of Fear is the second Sherlock Holmes novel I’ve read for the Chronological Sherlock Holmes Challenge. Holmes and Watson receive a strange message in cipher and divine that it reads “some devilry is intended against one Douglas,” the wealthy owner of Birlstone Manor in Kent. Sure enough, Inspector Macdonald turns up and tells the dynamic duo that Douglas has been murdered. Holmes is sure his nemesis Professor Moriarty is involved. Holmes and Watson travel to Kent to investigate, and Holmes quickly deduces that, as usual, the local constabulary has overlooked some important details and that there is a great deal more going on in the case than the murder of the gentleman of Kent. And also as usual, he’s right. Douglas’s murder is at the center of the Pinkertons’ infiltration of the Scowrers, a murderous gang affiliated with the Eminent Order of Freemen, a union/fraternal order that is somewhat harmless is some areas of the country, but which has a stranglehold on the Vermissa Valley in California. 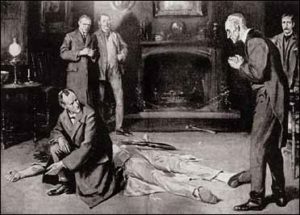 In the denouement, Holmes is more convinced than ever that Moriarty is at the heart of even this far-flung criminal organization. I find myself perplexed again by this novel’s placement in the chronology adopted. I know I have mentioned this issue several times, but it feels so clearly late that it doesn’t seem right here; however, I should mention that in this novel’s case, there’s nothing to put my finger on really except writing style, and that’s explained by Conan Doyle’s having written it later. I enjoyed it more than I thought, especially after I caught wind that Conan Doyle was once again going to try to set part of the novel in America. My previous experience is that he doesn’t really understand Americans all that well. This novel, however, didn’t betray the usual issues (inaccurate dialect, being chief among them). It’s also based on the true case of Pinkerton agent James McParland’s infiltration of the Molly Maguires. Perhaps it’s the additional research Conan Doyle did that lends more of air of authenticity to the story. Once again, however, I found the parts of the story set in England to be far more interesting. Conan Doyle is clearly interested in America, but he writes more engagingly about his own home soil. Tell me you couldn’t hear Martin Freeman saying that to Benedict Cumberbatch.